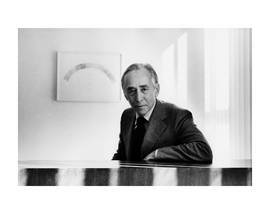 Art dealer Leo Castelli was once referred to as "the acknowledged dean of contemporary art dealers." In the late 1950s and well into the 1960s, the ever-expanding Leo Castelli Gallery became a major destination for second-generation Abstract Expressionists as well as Neo-Dada, Pop, Minimalist and Conceptualist artists. As new styles emerged, the Castelli Gallery continued to remain on the cutting edge. Castelli himself was widely revered by his peers for having an uncanny eye for young and fresh artistic talent. Leo Krauss was in the Italian port town of Trieste on the border of Slovenia in 1907. Castelli was enamored of literature at a young age. In 1919, Leo adopted his mother's maiden name of Castelli. In 1932 he met and married Ileana Schapira, the daughter of a wealthy Rumanian industrialist, and with his father-in-law's financial help, Castelli opened a Paris art gallery in the spring of 1939, which showcased Art Deco furniture, objects d'art and Surrealist paintings. The signature artwork at the gallery's opening was Pavel Tchelitchew's Phenomena (1936-38). As conflicts heightened throughout Europe and the Nazis invaded one country after another, Leo and Ileana retreated to the south of France. The Paris gallery remained open under the leadership of Castelli's partner, the architect René Drouin. The Castellis narrowly escaped the country before the German invasion of Paris in 1940. After taking a complicated escape route through Algeria, Morocco and then Spain, they finally arrived in New York in 1941. 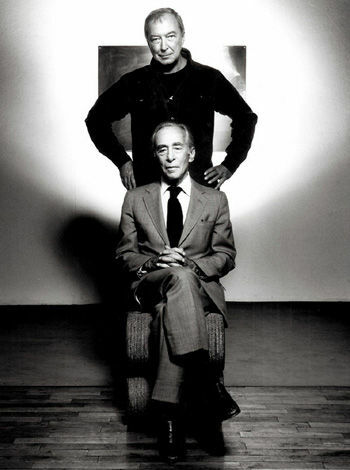 Leo Castelli was instantly attracted to the burgeoning art scene in New York. He began frequenting popular artist hang-outs on East 10th Street, The Museum of Modern Art in midtown, and the Hamptons on Long Island. He befriended the art dealer Sidney Janis and several of the Abstract Expressionists, including Jackson Pollock and Lee Krasner, Willem and Elaine de Kooning, and Hans Hofmann. In 1949-50, Castelli officially ended his association with his former Paris gallery and decided to focus all his efforts on organizing art shows in New York. He helped Sidney Janis curate the Young Painters in the U.S. and France exhibit at Janis' midtown art gallery, and played an integral role in putting together the seminal Ninth Street Show. The Ninth Street Show(May 21 - June 10, 1951) at 60 East 9th St.
Castelli called the Ninth Street Show "a celebration of Abstract Expressionism." The critic Irving Sandler recalled, "With the help of Leo Castelli, a group of charter members [John Ferren, Franz Kline and Conrad Marca-Relli] leased an empty store at 60 East Ninth Street for $70, and drew up an initial list of participants." Of the 60 or so works on display, included in the show were Pollock's Number 1 (1950) and de Kooning's Woman I (1950-52). Even though several major figures were absent from the exhibit (Still, Newman, Rothko, Gottlieb and Baziotes), one notable presence was Castelli's inclusion of a then unknown Robert Rauschenberg. Castelli once commented, "I decided to include Rauschenberg in that show, even though at the time the work seemed to have little to do with the Abstract Expressionist dogma. Perhaps it was an advance sign that I already saw beyond the Abstract Expressionists." Castelli became frustrated after years of bartering deals with Sidney Janis, and set out to open his own gallery space. In February 1957 he opened his gallery in his fourth-floor apartment on the Upper East Side of Manhattan. Initially unsure of what he wanted the gallery to represent, Castelli exhibited European works by Léger, Picasso, Mondrian, Kandinsky and Dubuffet along with various Abstract Expressionist works by Pollock, Smith and de Kooning. 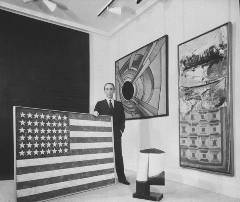 The first major exhibition for the gallery occurred in May of that year, entitled New Works, where Jasper Johns' early Flag (1955) painting was unveiled, along with Rauschenberg's Gloria (1956) and the works of other artists who marked a new phase in New York art. Of Johns and Rauschenberg in particular, Castelli recalled in 1970 that these two were his most loyal clients: "Although I knew already that Jasper Johns and Rauschenberg would be the stars of my gallery, I did not imagine that they would be the ones who appeared at the very beginning and would still be with me. There are no others except those two." In 1958, the gallery held solo exhibitions for each artist. The 1960s were boom years for the Castelli Gallery. Once Johns and Rauschenberg signed with Castelli, a new era had dawned for American art: Abstract Expressionism was fading while a crop of new styles took its place, from Pop and Op to Super-Realism and Neo-Expressionism. When Leo Castelli sold Andy Warhol's Campbell's Soup Cans (1962) it proved to be a critical moment for him as an American art dealer. The Castelli Gallery welcomed artists of all veins in the immediate post-Abstract Expressionist years, including practitioners of Pop, Minimalism and Conceptualism. Artists such as Lichtenstein, Rosenquist, Judd, Stella, Serra, Morris and many others were all represented in Castelli's original gallery on 8 East 77th, as well as the other gallery spaces Castelli acquired over the ensuing decades (two galleries in SoHo, in addition to his new expanded space just down the block on 18 East 77th Street). The Whitney Museum's director David A. Ross once commented that, "Wherever the important work was in postwar American art, Leo has been at the center of it." Practically every big name in American art during the latter half of the 20th century, from Willem de Kooning to Julian Schnabel, had been represented by the Leo Castelli Gallery at one time or another. Like most art galleries of the era, it began as a small and modest enterprise, exhibiting a few European paintings by reliable greats. But soon thereafter, the Castelli Gallery rose to prominence by placing its stock in three major artists who collectively marked a new era in American art: Johns, Rauschenberg and Frank Stella. From that point forward, the Gallery was a premier destination for any rising or established artist, American or otherwise. Opening just a few months after the gallery opened its doors, this groundbreaking exhibition unveiled two young artists to the world: Jasper Johns and Robert Rauschenberg. While other notable artists were on display, it was Johns and Rauschenberg who stole the show. Their new and refreshing explorations of flatness and plasticity marked a new era for Abstract art, thus making the Leo Castelli Gallery the starting point for the emergence of Neo-Dada and the ensuing Pop art movements. With the rapidly-growing popularity of Johns and Rauschenberg in motion, Castelli gave each artist his own solo exhibit at the gallery in 1958. Critic and Art News editor Thomas B. Hess paid a visit to the gallery before Johns' opening, and was so taken with the artist's Target with Four Faces (1955) that he asked Castelli if he could borrow it. Castelli agreed and not long after this, the artwork appeared on the cover of Hess' Art News, a full month before the exhibition opening. "... in my first show I wanted to stress this idea that American painting was just as good as the European, the great Europeans. So I had a show which included Léger, Mondrian, Giacometti, Dubuffet, to mention just a few Europeans, plus Pollock, David Smith, and de Kooning ... From then on I really didn't know exactly what to do ... Some of my Abstract Expressionist, young Abstract Expressionist friends wanted to show in the gallery, and I was game, but I wasn't convinced that that was the ultimate goal, that I had to show secondary Abstract Expressionists." "Two years after Johns, Frank Stella appeared in 1959. Right after Stella, we had the Pop artists, then the Minimalists, then the Conceptualists. It was astonishing. In 15 years I found them all." "Leo has all the right instincts. He has enough business sense to keep the gallery doors open, but he's less interested in money than he is in art. He's very much for the artists."